ASCD Webinar: PD, Data, and Teacher Ratings—These Systems Just Aren’t Working! PD, Data, and Teacher Ratings—These Systems Just Aren’t Working! Deep down, most school leaders understand that the current models of teacher development aren't working very well. We lead weekly professional development (PD) sessions, meet with instructional teams to analyze data, and evaluate teachers using the latest rubric, but the teachers in our schools aren't getting much better. Let's face it. These systems fundamentally miss the point because we aren't doing the one thing teachers need most to improve: we aren't providing an expert to help them plan, practice, and deliver tomorrow's lesson. 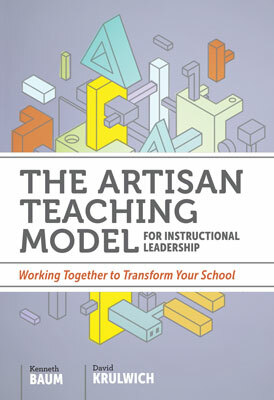 In their new book, The Artisan Teaching Model for Instructional Leadership: Working Together to Transform Your School, Kenneth Baum and David Krulwich suggest an entirely new system that reorganizes teachers into small collaborative teams that do their most important work together. Each team is led by a "team leader" whose teaching reflects the artistry the school expects. These teams meet every day to design engaging and challenging tasks for children, share lesson plans, and debrief the results. Artisan teaching teams are fundamentally different than traditional department- or grade-level teams because they share the work of lesson planning every day. In this webinar, the authors will present the rationale for their new teacher-support model and share specific details on how it can be implemented in any school. They will provide analogies to PD that occurs in other professions—where successful experts (artisans) are partnered with newer members of the profession (apprentices) to execute the daily work. They will also explain how school leaders can reorganize their time to create this system of authentic teamwork while simultaneously providing sustainable mentoring, organizational coherence, and leadership development. All of the other add-ons (PD, data analysis, rating systems) become superfluous because these goals are embedded into the daily work of the teams. Kenneth Baum is an award-winning former principal and superintendent, and an expert in school design, strategic planning, and leadership. His experience leading in both the district and charter settings has given him a deep understanding of today's leadership challenges. David Krulwich is principal of the Urban Assembly School for Applied Math and Science (AMS) in the Bronx, New York, where he leads a highly successful, non-screened, public school serving over 600 students in grades 6–12.